Rachel Elnaugh Entrepreneur: Some businesses are still doing brilliantly ! Some businesses are still doing brilliantly ! There's so much doom and gloom in the media about the economy, it's great to get a different perspective... 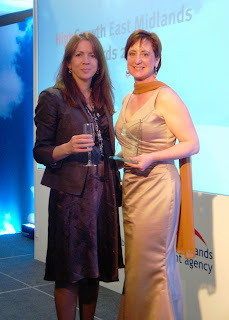 This week I was at the High Growth East Midlands Awards organised by EMDA (East Midlands Development Agency) as a guest of Sarah Coleman of Business Evolution Business - who won The Growth Enabler Professional Excellence Award (she is a business coach). The speaker was Sir Ranulph Fiennes whose world exploration trips have been legendary, and who talked about keeping going in the face of adversity - a great message for all who may be in business and struggling. All in all it was a wonderful evening of hope, optimism and positivity - and best of all I didn't have to get up there and speak - so could really relax and enjoy the evening! A big congratulations to Sarah and many thanks to her for inviting me. Why does it say Rachel Elnaugh entrepreneur at the top of the page? Does Rachel actually have a business? I don't think she does. She did have and I respect what she achieved there, but she's been out the game for years. Wouldn't it be more accurate to say Rachel Elnaugh consultant/c-celeb? Now I don't understand what these consultants actually do? - although I know there are a lot of them. Maybe RE can help me here? I mean when I'm finally free of the stupidity of people above me, when i've worked like Billio to get my own business going, why would I want to be asking a guy/girl what I should be doing? Why do I bother striving for my own business for that kind of 'false freedom'? If you're sharp and you have an idea, no way should you have to ask anyone's advice. You'll know exactly what to do. If you don't have both of those attributes then the last thing you want is to start a business of your own, not everybody's destined to work for themselves or lead others. I'm interested in starting my own business but at the moment I'm working hard to get the funds together to get it off the ground and reduce my borrowing on day one. I suppose my question is how can Rachel help someone like me? You succeed by taking on-board what others have to say, wether you use the advice or not is your decision, as there is no such thing as bad advice. People like Rachel are there to help and advise on many things, this is all good knowledge, how you use the knowledge is up to you, only you can be the deciding factor of YOUR DESTINY, no one else. We all go through life continuously learning, digesting all kinds of information, but, sometimes we must ask for that help and guidance, as one cannot do it on their own entirely. I was about to ask if you had ever run a business until I saw your last paragraph. I can only speak for myself and tell you of the help that Rachel and people like her who are very passionate about business and entrepreneurship and the wellbeing of small enterprises in the UK. Rachel acts as a mentor for small business owners, she provides support and advice (which you are at liberty to reject if you don't find it worthwhile) based on her impression of your business. She will spend a lot of time with you and your business and will be on hand when you need her. Because of this, Rachel has built up a network of expertise based on an extensive list of contacts and can put you in touch with the relevant people to deal with relevant issues. The world economy is at crisis point and some businesses are feeling the pressure - sometimes you can feel as a business owner that you are all alone out there. Reaching out to a mentor can save your sanity sometimes. I don't know if you have ever tuned in to any of Rachel's webinars - they are quite inspiring, I found Imran from iTeddy very inspiring indeed, and there was a great session a couple of weeks ago on search engine optimisation - you have to pay good money to attend seminars like this and Rachel is currently providing them for free. You have to ask why such a busy woman, with a large family and other commitments is doing all this and then appreciate the passion and the energy that she puts into it. I speak from experience - Rachel is my mentor and friend. Yes she has a business, she is not a charity, she charges for her services but what I have received over the last couple of years has been pretty invaluable. I too saved up and put a lot of money into my business but there are things i wish I had known then which obviously I know now. I would definitely have spent my money a bit more wisely. I get the impression you are quite a young person - can i hazard a guess - say under 25? I am under 25 myself I am 22 almost 23 and I am planning my business idea as we speak I have 2 or three ideas that I would like to do. But I know I have to keep focused and channel the vision to just One thing at a time or else I would neglect other vital things in One entity. The business world is lonely out there, and you can feel stupid sometimes and question youself but being a business owner is about being POSITIVE being STRONG. I have emailed Rachel once or twice, and she is always a great in her resposnse and echo's what I have stated here "If you have the passion and the belief then you will do it". Yes the Economy is in a fragile state, and yes saving is hard to do I know I am doing it at present. But lastly you can only get to where you want to be if! You want to!!! Remember Excel Spreadsheets are an absolute godsend, be at one with them. If the definition of a business is that you have income (from delivering products or a service) and a resulting profit then, yes I most definitely have a business! Actually the Enterprise sector is booming at the moment, it is one of the most buoyant sectors to be in currently, supported by both government monies/funding as well as indiviudals realising the benefit in investing in skills/knowledge to help them unlock the value in their business. I am sorry if this does not fit your narrow definition of what an 'entrepreneur' does for a living!!! By the way, thinking you can do it all alone and/or believing that you don't need any outside help/assistance/training (whether that be from consultants, mentors, training courses, books or whatever) has to be the highest form of stupidity. Why on earth reinvent the wheel when you can learn from so many people who have been there before you and have been through the pain of the learning curve? Reynolds - the most successful entrepreneurs on earth point out that one of their biggest keys to success, is the ability to gather the right people around them. Nobody can be an expert at everything - and everyone needs outside input. And one of the key roles for a consultant and mentor, is that you can get so close to the trees, you no longer can see the wood. Oops...browser had a dicki fit, and posted my post before I had finished. I was going on to say....Sir Ran had a go at the Lakeland 24 hour mountain round two years ago, and I had the pleasure of his company and navigating the night leg for him. Sadly he didnt get round in time, but there is always a next time. I think you will find successful entrepreneurs are continually learning adapting and listening to others. It is not only vital for your self growth as an entrepreneur but also that of your business. By actively avoiding this you are shooting yourself and your business in the foot. You not only need to lead others but you also need to inspire them and make them feel valued enough to follow. If you are not interested in anyone's opinion but your own how can you do this? Successful businesses also listen to their customers and structure solutions accordingly, will you ignore them as well?